Founded by James Wood in 1752, Winchester began as a small farming community and prospered as the county seat and as a trading center at the junction of several turnpikes. Its strategic location in the Shenandoah Valley contributed to Winchester’s involvement in the French and Indian, Revolutionary, and Civil wars. From the 1870s to the 1920s, the community served as the Valley’s leading commercial and industrial center. During the present century, Winchester has been the hub of Virginia’s apple industry. The historic district incorporates approximately forty-five blocks of both commercial and residential properties along its grid-plan streets. The area is particularly rich in early vernacular log buildings, early stone houses, and Federal town houses. It also boasts an important collection of Victorian commercial buildings and large residences. 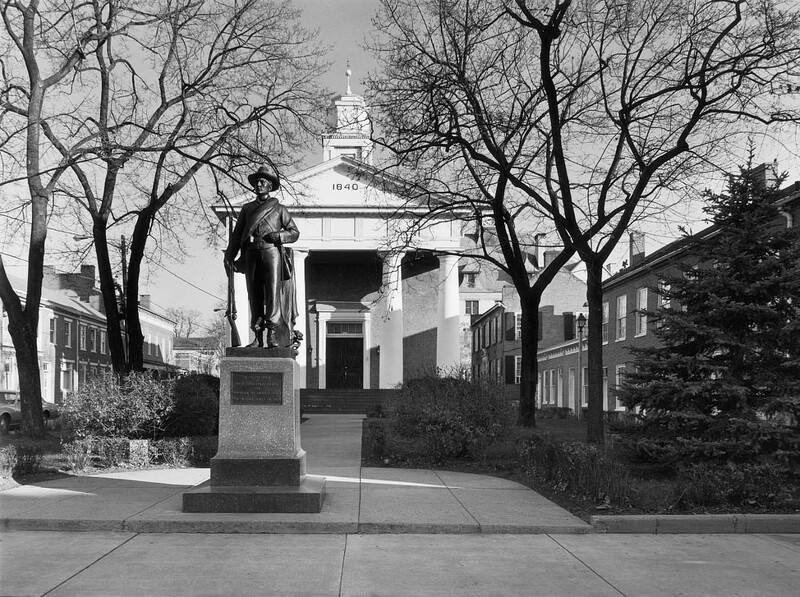 The heart of the district is marked by the 1840 Greek Revival Frederick County Courthouse. In 2003, the Lewis Jones Knitting Mill at 126 North Kent Street was brought into the district inventory via a small boundary expansion. This two-story, five-bay, gable-facing brick building on a random rubble stone foundation and capped by a gable roof surmounted by a monitor was the only cotton mill in Winchester. Founded in 1895 by Lewis Jones, Sr. of Philadelphia and Albert Baker of Winchester, the enterprise made women’s underwear and hosiery. In 2008, the district was again expanded to include buildings that accommodated flour milling, lumberyards, wood product manufacturers, a foundry, as well as retail operations for groceries, dry goods, liquor, furniture, farm implements, fertilizers, and seeds. Several warehouses and storage buildings constructed for industrial production are also included. Re-documentation of the properties within the original boundaries of the district was undertaken in 2013. An update to the nomination was accepted to the National Register changing the period of significance for the district to a range from 1752 to 1964, and including a revised district inventory. An expansion completed in 2015 added approximately 170 acres to the district and acknowledged historic neighborhoods associated with the development of Winchester, principally the Amherst and Stewart street corridors, and adjacent residential blocks, and areas of the colonial town at the south end of the historic district. The expanded district also includes Glen Burnie and the Hawthorne and Old Town Spring site, both of which are listed individually in the state and national registers.